The Eagle Nebula, perhaps one of the most famous and easily recognized space objects, is a young open cluster of stars in the constellation Serpens, discovered by Jean-Philippe de Cheseaux in 1745-46. It is associated with a diffuse emission nebula, or H II region, which is catalogued as IC 4703. This region of active current star formation is about 7,000 light-years distant. The brightest star in the nebula has an apparent magnitude of 8.24, easily visible with binoculars. Images made in 1995 by the Hubble greatly improved our understanding of processes inside the nebula. 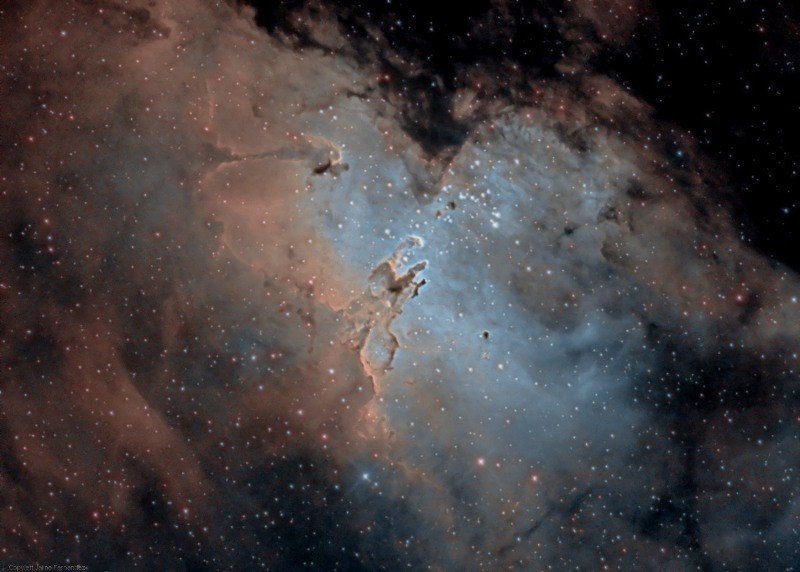 Eagle nebula's region known as "Pillars of Creation" is a large region of star formation. Its small dark areas are believed to be protostars. The pillar structure of the region resembles that of another, much larger star formation region, imaged by Spitzer Space Telescope in 2005 in Cassiopeia, which is designated W5 and usually called "Mountains of Creation". Combination of an X-ray image from the Chandra observatory with Hubble's famous 'Pillars of Creation' image have shown that X-ray sources (from young stars) do not coincide with the pillars, instead randomly dotting the area. This suggests that star formation may have peaked approximately one million years ago in the Eagle Nebula and any protostars in the pillar EGGs are not yet hot enough to emit X-rays. Standard processing for each individual picture. Narrowband combination with PixelMath and LRGB combination using enhanced Ha image as luminance. PixelMath using the following formula (from PixInsight forums):R = 0.5*S2 + 0.5*Ha ; G = 0.15*Ha + 0.85*O3 ; B = O3.